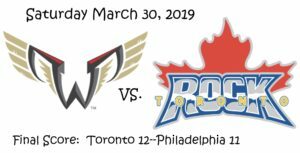 In this past week’s NLL action the Philadelphia Wings (3-11) traveled north to take on Eastern Division foe the Toronto Rock (9-5) at the Scotiabank Arena on Saturday March 30, in front of a crowd of 11,244. This was a must win for both teams as the Wings needed the victory to help keep their postseason hopes alive; and the Rock, with a win would punch their ticket to the postseason and sweep the series. Both teams would fight down to the final minutes with the Toronto Rock coming away with the win by the score of 12-11. Toronto would come out on top in the first period as they would outscore Philadelphia 3-1. Leading the way for the Rock would be Johnny Powless (3g, 4a) who would net two out of three scores for Toronto with teammate Challen Rogers (2g, 1a) netting the third. The Wings lone score for the period would come at the hands of Matt Rambo (3g, 3a). The Rock would hold a 3-1 lead at the end of the first period. The Rock would keep the pressure on going into the second as they would tally off the first two scores to go up 5-1 over the Wings coming at the hands of Rob Hellyer (3g, 3a); and Rogers. Philadelphia’s Kevin Crowley (2g, 4a) would finally slow the Rock as he would find the back of the net at 3:56 to make it a 5-2 game. Toronto would tally off two more in the period, one from Dan Craig (2g, 3a); and the other from Powless for the hat trick on the night. However, Philadelphia wouldn’t go away quietly as they would net two of their own to make it a 7-4 game heading into the half, both scores would come from the likes of Jordan Hall (4g, 1a). Third period action would see Toronto come out on top outscoring the Wings but Philadelphia would keep it close. Toronto’s Hellyer would net two of the four with teammates Craig; and Tom Schreiber (1g, 3a) netting the other two. The Wings would net two more from Hall; with teammate Crowley netting the third for Philadelphia. Score at the end of three: Toronto 11—Philadelphia 7. In the final frame, the Wings defense would hold the Rock to only one goal, and their offense making a comeback as they outscored the Rock 4-1 but it wouldn’t be enough as Toronto would hold on to a 12-11 win to lock up their post season bid. The Toronto Rock (9-5) play host again but this time to an Eastern Division opponent the Buffalo Bandits (12-3) on Friday April 5, game time 7:30 p.m. EST; and will head over to Rochester for their double-header weekend to face the Knighthawks (3-11) on Saturday April 6, game time 7:30 p.m. EST. Philadelphia (3-11) will host the Calgary Roughnecks (7-8) on Saturday April 6, game time 12:00 p.m. EST.